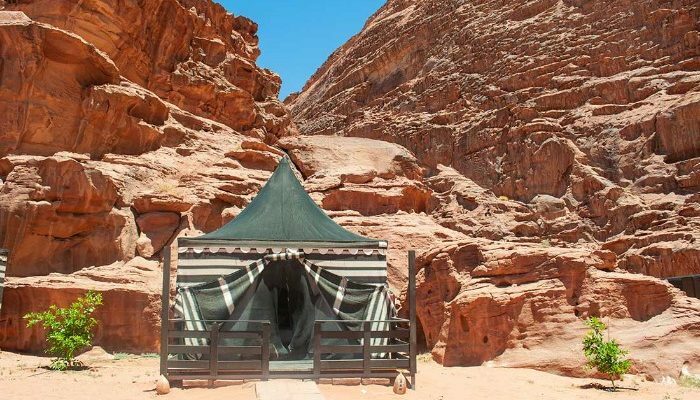 When you think of the nomadic Bedouin who live in Wadi Rum, your mind may conjure up images of a white-clad Lawrence of Arabia, or silhouetted, turbaned men astride camels, cutting lonely figures across a Mars-like landscape. And to be honest, as I discovered on my recent trip to Jordan, in many ways that isn’t too far from the truth. Some Bedouin still live in the desert, in tents they have woven themselves from animal hair. Some still cook zarb, a Bedouin BBQ, where meat and vegetables are buried in a hole in the sand with hot coals for a few hours, until it is ready to eat and shared around the campfire. And some still ride camels and herd goats. Nowadays, it isn’t uncommon to see cars in Wadi Rum. But life for most Bedouin is changing. Nowadays, there are Bedouin villages, where people build permanent houses – not luxurious by any means, but still, they have electricity and running water and are a far cry from the traditional nomadic lifestyle of their ancestors. Some Bedouin that have not yet moved to a village have become semi-nomadic, and will base themselves at permanent campsites with generators and running water, meaning they can charge their mobile phones in their tents. They get around in Toyota utes, so can pop down to the Bedouin village to get groceries when they need them, rather than having to walk miles to a weekly market and stock up. Our Desert Camp in Wadi Rum. Image by Daniella Van Haltren. After a long day of sightseeing in Wadi Rum, our local leader told us it was time to make our way to the Desert Camp, where we would be staying with the Bedouin for the night. I imagined we would be sleeping in two-man tents and if we needed to go to the toilet, it would mean taking a shovel and finding a private spot behind the towering rocks. But I couldn’t have been more wrong. Our permanent campsite did have tents, but they were spacious, with comfortable beds, wooden floors, electricity, vibrant décor and even bedside tables with boxes of tissues. 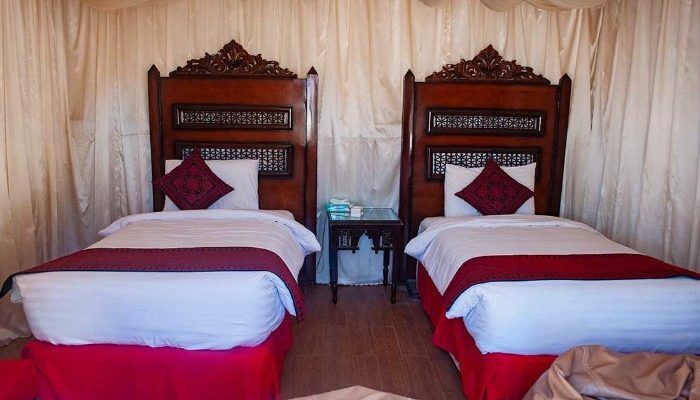 Each “tent” has it’s own private Western-style bathroom, with towels and soap provided (although if you can avoid taking a shower, it’s more considerate not to use up the limited water in the desert). This is glamping, not camping. Image by Daniella Van Haltren. But, aside from the comforts of the campsite, another part of the experience that surprised me was how hospitable our hosts were. They didn’t just have us to stay, they welcomed us into their tribe for the night. The dinner they graciously prepared for us was the best meal I had during my time in Jordan – and that’s saying something. The vast buffet of dips, breads and salads was capped off by the centrepiece – a magnificent chicken and vegetable zarb, dug up right in front of our eyes. And then, when we thought we couldn’t eat another bite, the plates of pastries and unlimited cups of tea appeared. In my years of travelling, I had never thought I would be tasting traditional Jordanian dessert in the desert. After dinner, we moved from the dining tent to the campfire. One of the Bedouin, named Salim, sat with us around the glowing embers telling us his favourite jokes (such as, ‘why do we go to our tent every night to sleep? Answer: because it won’t come to you). Before long, the conversation turned more serious. 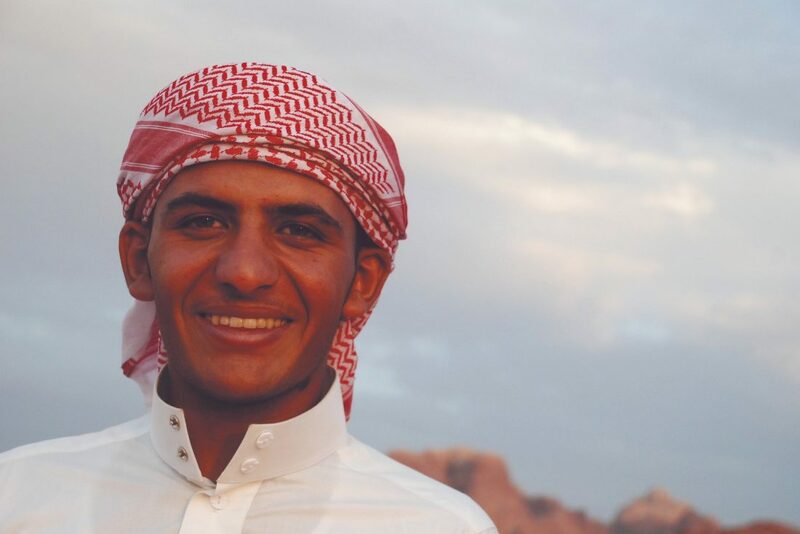 “What is life like as a Bedouin in 2018?” we asked Salim, “How have things changed since your parents were your age?”. 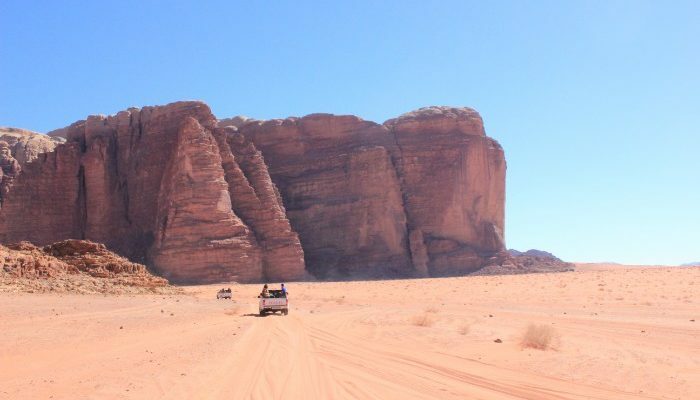 Salim told us that his parents lived in another part of Wadi Rum, about 20 kilometres away. While some of the modern commodities have been an adjustment for them, he smiled as he told us how happy his mother is to be able to talk to him on her mobile phone each day. 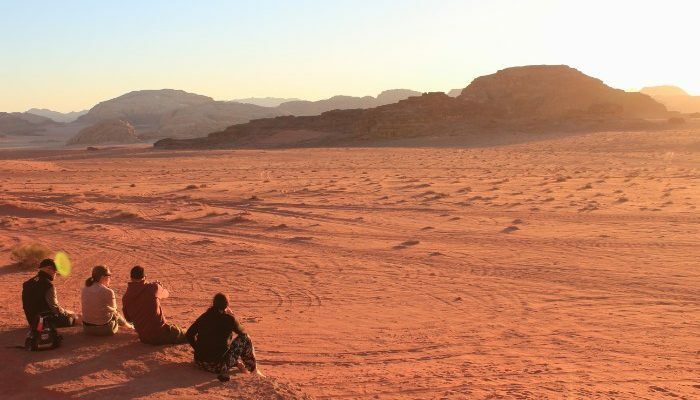 Our group watching the sunset in Wadi Rum. Salim told us that he had a fiancée. He had only met her a couple of times (the marriage had been arranged by their families), and they had never spent any time alone together. She lives in the Bedouin village, so part of the agreement of their marriage was that he would build a new house for them to move in to. He had hoped that it would be finished by now so they could get married this month, he explained seriously, but he wasn’t sure if he would be ready in time. When I asked Salim if he was happy to be marrying her, he smiled. After a few hours, as some members of the group drifted off towards their tents, we fell quiet and gazed up at the stars. With the generator now turned off, the great expanse of Wadi Rum was silent, except for the crackling of our dying fire. It will never cease to amaze me as to how many more stars you can see when you’re out in the wilderness, away from the reflective lights of the suburbs or cities. The desert looked like it had been draped in inky black fabric, that someone had spilled a container of silver glitter and sequins all over. After a final cup of tea, we quietly bid Salim goodnight and left him lying in the darkness under his thick cloak, gazing up at the stars of his desert home. 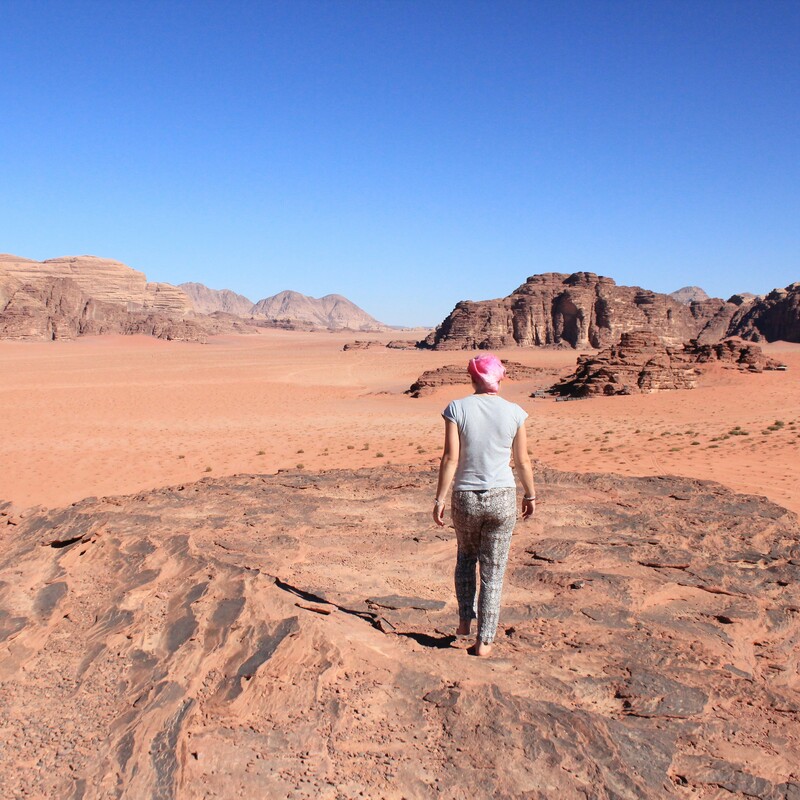 Do you want to stay with the Bedouin in Wadi Rum, plus see all the other highlights of Jordan? Book a small group tour with Peregrine. Hero image by Sarah Reeves. All other images c/o Amy Foyster.